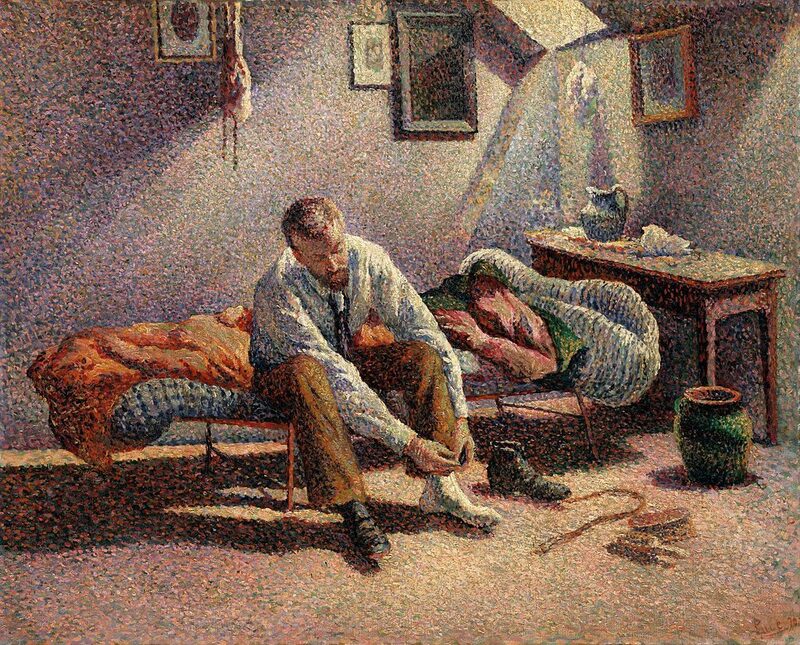 A young man has just dressed and sits on his flimsy bed in order to put his left boot on. His room is sparsely furnished – all we can see is a narrow table upon which sits a large jug; there is a vase nearby and a number of pictures are arranged haphazardly on the walls. Light enters the room through two roof lights so we can assume that the room is a garret, the habitual habitat of the penurious artist. The artist in question was Gustave Perrot, a fellow artist and friend of Luce. The room is rendered in points of orange, yellow, red, light blue and violet – combinations of which are beautifully modulated to reflect the differing fall of light throughout the space. Other colours are used for vase, trousers and bedclothes. Perrot apparently died tragically young but his limited output was commemorated at the 1892 Salon des Indépendants with fifteen pictures.